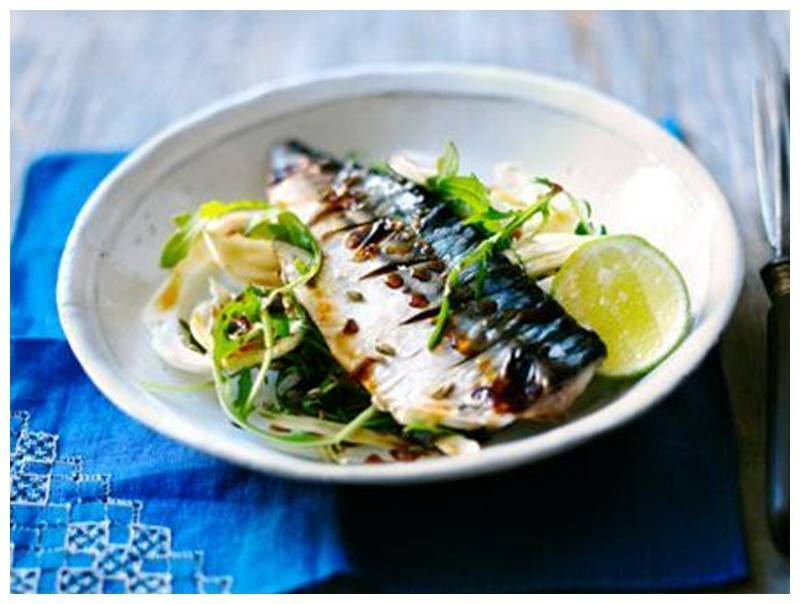 A recipe for roasting mackerel. This recipe includes Greensweet liquid stevia processed. Rinse the fillets under running cold water. Then dry them with kitchen paper. Mix in a wide bowl sake, Chinese rice wine or dry sherry (fino), Greensweet-stevia and lime or lemon juice. Put the fillets in the marinade. Leave them for 2 - 3 hours. Turn the fillets from time to time so that the marinade could withdraw well. Heat a grill pan or plate (or on the BBQ). Spread a little oil with a brush (or a dot of kitchen paper) (not on BBQ). Dry the fillets with kitchen paper and brush them with a brush with oil. Roast the fillets on both sides for 5 - 6 minutes until golden brown and just cooked. Sprinkle the fillets with some (sea) salt if necessary. Bring the rest of the marinade to a boil in a pan. Let simmer gently for 3 - 4 minutes. Meanwhile cut the cleanly polished lime or lemon in 6 parts. Remove any seeds that may be present. Divide the roasted fillets over preheated plates. Arrange the lime or lemon wedges along with the celeriac next to it. Serve the hot marinade in small one-person bowls. The lime or lemon wedges and the marinade are over the fish.